Source: ARTBA analysis of federal highway obligations between October and December of each fiscal year. State and local highway agencies continued to obligate federal funds for highway and bridge improvements at a slow pace in December, constrained by the small amount of funds apportioned under the Continuing Resolution (CR) funding the federal government through December 11, 2014 (P.L. 113-164). 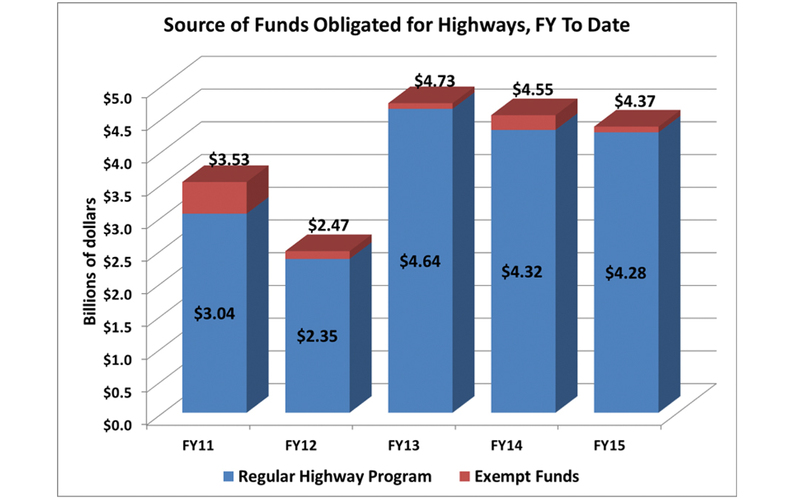 Even though Congress passed a full-year appropriations bill in December, the Federal Highway Administration (FHWA) had not as of January 12 notified states of any additional obligation authority, so state DOTs operated during the month on the basis of the $6.99 billion of federal highway funds that were distributed on the basis of the CR. In addition, states also had $6.09 billion of highway funds that were carried over from previous fiscal years, $3.86 billion of which represent funds that Congress earmarked for specific highway projects. The total available for obligation so far during FY 2015 is thus $13.17 billion. Of this, state and local transportation agencies have obligated $4.37 billion for highway and bridge improvements, down 3.8 percent from $4.55 billion during the first three months of FY 2014. Another $205.8 million has been flexed to transit improvements. Additional funds should be apportioned in January, based on the appropriations legislation Congress passed in December. When a state or local DOT has an eligible project ready to go to construction under the federal-aid highway program, it enters into a project agreement with the FHWA that obligates the federal government to pay its share of the project cost. The project can then proceed to bidding and construction. Obligation of federal funds is a leading indicator of highway construction activity in the U. S.